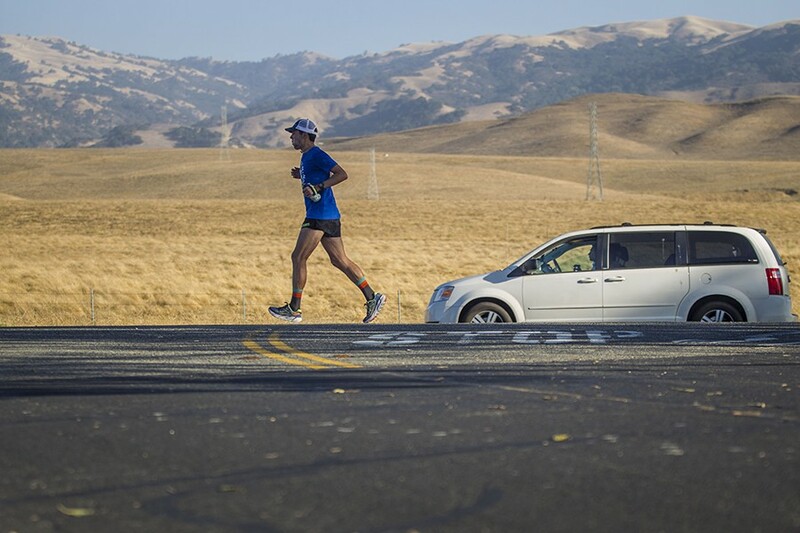 Pete Kostelnick, 29, was already running marathon-plus distances almost every day when last fall he decided to attempt to break the record for running across the U.S. — a “race” that started at the San Francisco City Hall and ended at the New York City one. At 46 days, the record had stood since 1980 and had long been a white whale for extreme distance runners, none of whom could seem to top it. My rebuttal was that they didn’t know my training. 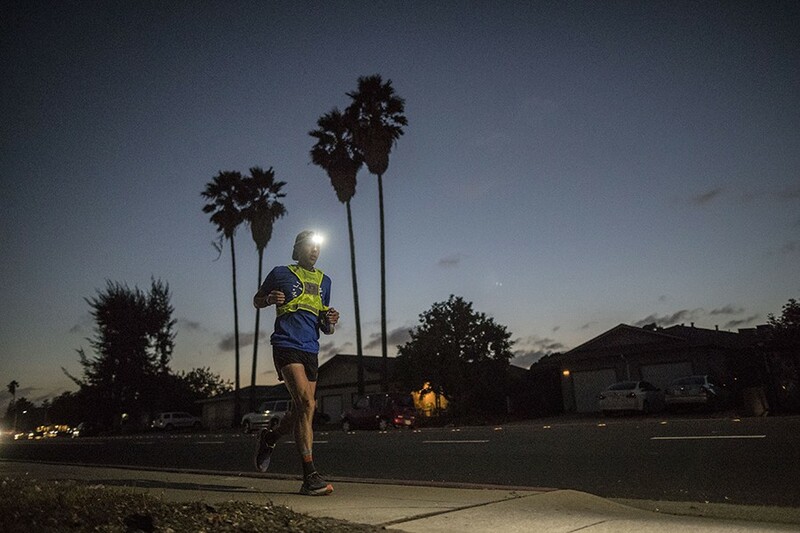 Because at the time, I was running about 30 miles a day, and doing the type of distances on weekends that I’d end up doing almost every day of the run across America — 70 miles. Essentially, I’d wake up, run from 5 a.m. to 7 a.m., go to work as a financial analyst until 5 p.m. and then run a few more hours after work. I decided to try breaking the San-Francisco-to-New-York record after winning the Badwater 135 in July 2015. That’s a 135-mile race from the Badwater Basin in Death Valley, the lowest point in North America at about 280 feet below sea level, nonstop to the portal of Mount Whitney at around 8,300 feet above sea level. I knew then and there that I was in the right condition to try running across the country in less than 46 days. The rules are simple: San Francisco City Hall to New York City Hall. The clock starts when you start, and it doesn’t stop until you stop. I began during rush hour and on winding San Francisco highways with no shoulders. There were cars all over the place. I felt like I was a small fish with a bunch of sharks chasing me. All I could keep thinking was, Okay, this is my life for the next 40 days: dodging cars and hoping I don’t die. Even if I’m able to do all 3,067 miles of this run, it could be completely out of my hands if a car just nails me and kills me. We chose the route I ran because it was the fastest with the most reasonable changes in elevation (at least so I thought). It also let me run through the two towns I lived in most of my life: Boone, Iowa, and Lincoln, Nebraska. I worked mostly with Charlie Engle, one of the ultra-distance runners I admire most, to make sure it passed the ultrarunning “sniff” test. A crew of four people were with me the whole run. Cinder Wolff drove our RV and cooked these great dinners for us — steaks, lasagna, homemade breads, tater-tot casserole. Pretty much anything you can cook with a pressure cooker. Her real specialty, however, was massage therapy. And so, she would give me a massage every night before I went to bed. We also got into a good stretching routine — first thing in the morning and then again after lunch during a break. That helped a ton with my daily recovery. Dean Hart, an EMT, and Chuck Dale drove a smaller vehicle to help me as I was running. That could’ve been anything from giving me a cold cloth for my face or a breakfast sandwich and Diet Coke from McDonald’s. Yes, I drank soda on this run. 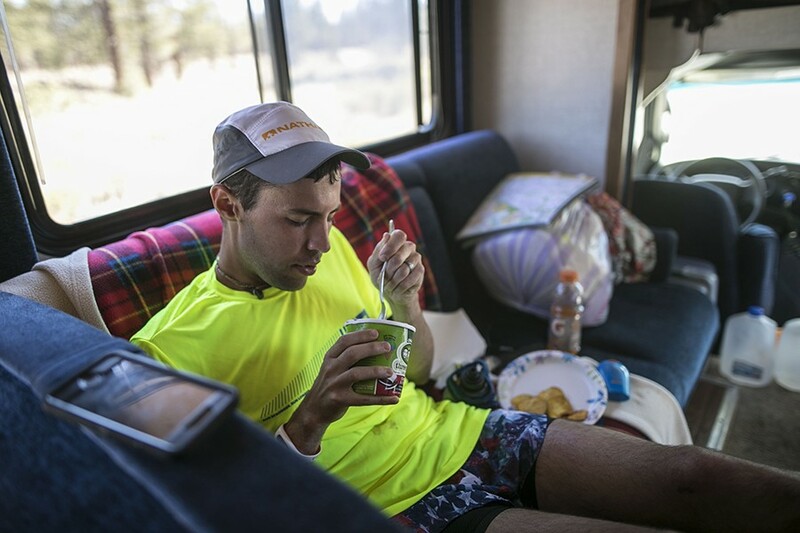 You’d be amazed at how unhealthy ultra runners eat — I’ve seen other guys sucking down gummy bears on these runs. 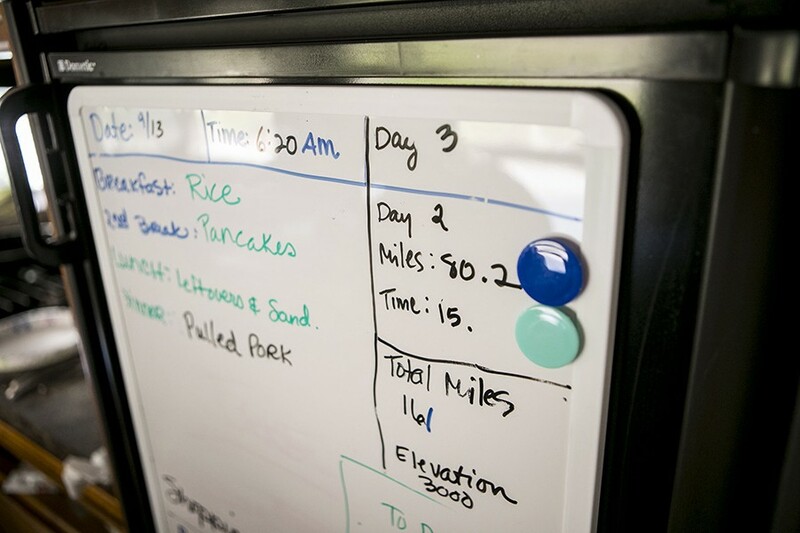 Meanwhile, Trasie Phan figured out logistics (things like keeping track of the weather and determining where we should stop at night). I didn’t see my wife, Nikki, the whole time. She’s actually a runner, too. When we first started dating, we’d have these little competitions to hit better and better personal records. Any time I’ve ever thought about doing something in running or life, I’ve always gone to her first. And she’s always been perfect about handling it and making sure I don’t bite off more than I can chew — the run across America included — or helping me understand that I can chew off as much as I can bite. Still, it was hard not to see her every day, even though we tried to talk on the phone every other day. Outside of San Francisco, my next challenge was Yosemite. The highest point I ran through there was 11,000 feet, or 7,000 feet higher than anywhere else I’d been. That led to some severe tendonitis in my ankles and shins that got progressively worse in Nevada. I was getting really sick from the sun as well, with a severe fever and chills from being in the desert all day. It was a perfect storm and resulted in my taking off Day Seven completely. A lot of people thought it was funny — “on the seventh day he rested,” like it was a religious thing. But I just had to. It was probably the smartest thing I did, even if it cost me 24 hours. Luckily, it was really flat from eastern Colorado to western Pennsylvania. The sights weren’t as good — I’ll never forget the moose, mountain passes and sunrises in the Rockies — but I was still happy to see the cornfields of my home states of Nebraska and Iowa. They gave me comfort and energy at the same time; that’s when I got into a pretty good groove. At night, we could usually find a farmer or rancher who would let us park the RV on their property. They didn’t know why I’d do something crazy like run from San Francisco to New York City, but they still treated us like family. So many people selflessly went out of their way for us like that. Another good example: I was a little anemic before starting the run. When word went out that I had to eat red meat to keep my iron up, all these people in Iowa and Nebraska started giving us steaks. I had a swollen knee in a lot of the Midwest, especially in Indiana where one knee grew to twice the size of the other. It was weird because it didn’t hurt at all, but it was concerning. My arm hurt from swinging all day, too. My shoulder blade had this weird creak in it as well. I’d always prided myself on not blistering, but I had a pretty big one on my left foot that was a serious nuisance. All of this sort of culminated in Pennsylvania. People were already congratulating me, but I still had this large state to run through. It felt like it had the most elevation gains, too. It was deceiving because I always think of Colorado, Utah, and to a lesser extent, California as more mountainous. But Penn was up and down, up and down. No good roads at all. No good shoulders on the highways. Lots of winding hilly roads. Not to mention that it was either very hot or raining. In fact, there were two whole days where it didn’t stop raining at all. On the very last day, I had about 87 miles left to go. The plan was to do an extra long day. I only got a few hours of sleep and woke up at midnight to start running. That was one really long day. I was freaking out because I was so fatigued from getting so little sleep. I kept thinking, This is a bad idea. I was making great time: I was about four days ahead of the record if I could make it through this day. But I keep thinking about how I pushed myself too hard in Yosemite and lost serious time. What if that happened again? And on this last stretch no less? Worse yet: What if I didn’t finish at all? With about 15 or 20 miles left, however, I tripped and fell while a friend was videoing me on Facebook Live. It was embarrassing because it tore up my right knee and you could hear me screaming and going on. But it also gave me yet another surge of energy to get across the bridge to New York City. I could now see everything in plain sight. I had less than 12 miles to go. I knew I was in the clear. People kept telling me how close I was, but all I saw were skyscrapers and buildings. The next thing I knew, though, I’m standing on the steps of New York City Hall. It was about 5:30 p.m. A few dozen people were waiting — including Nikki. That was powerful, just to see her again after not seeing her for about seven weeks. I was so happy to be there with her, along with my parents, two sisters and some close friends. But mostly, I was numb. Maybe the exhaustion was setting in. Or maybe I was relieved that I didn’t have to wake up to run 70 miles the next day. More than six months later, I’m still trying to figure out what completing the run means to me. All I really know is I want to keep running long distances. 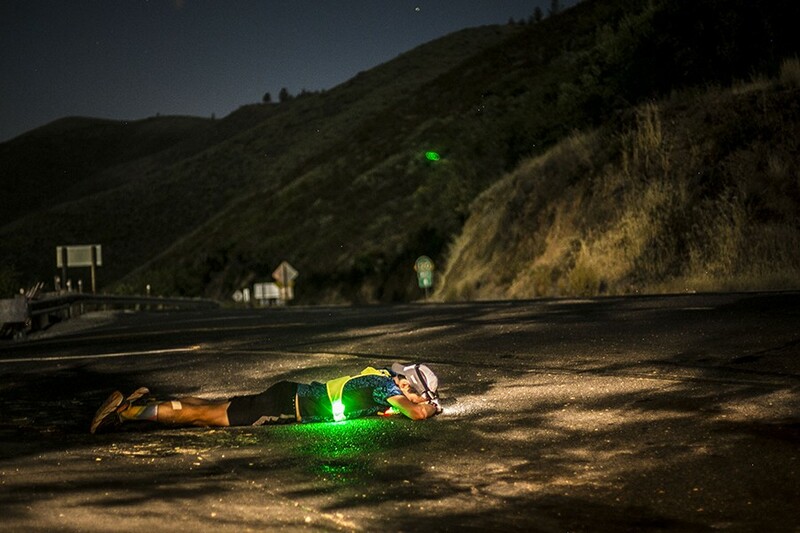 I’m currently running in Europe, and then I come back for the next Badwater 135. Maybe the lesson then is that I find more enjoyment in searching for something rather than finding it.